A fist fight broke out in a local campesino union office in La Paz one afternoon last April while I was waiting to interview the union’s leaders. The fight was over how funds for government-supported projects were spent. 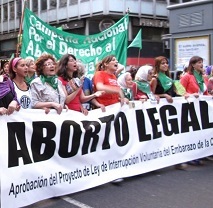 Last week, at a campaign rally for an El Alto mayoral candidate losing in the polls, speeches were largely about the struggle over the political capital and legacy of a series of anti-neoliberal rebellions in the early 2000s. And this past Sunday, the party of President Evo Morales, the victor in general elections last October, lost key races in regional elections across the country. Such events point to the contested nature of Bolivian politics within and without the so-called “process of change” under Morales. Popular uprisings helped paved the way to the 2005 election of Evo Morales, the country’s first indigenous president and a leader who promised to bring about long-overdue socialist and anti-imperialist changes to the impoverished, but resource-rich, country. The campesino and indigenous movement protagonists of the 2000s are now largely aligned with the Movement Toward Socialism (MAS), Evo Morales’ political party. 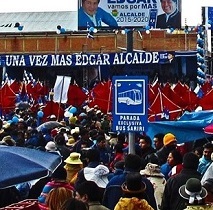 In the lead-up to Sunday’s regional elections, this support was visible in neighborhood council offices in El Alto, where campaign literature for MAS candidates was distributed, and in a major campesino confederation in La Paz, where a massive campaign banner blanketed office headquarters. But when talking with movement leaders inside these buildings, it was clear that their support was critical and uneven. While most backed Morales, they were also critical of right-wing politicians brought under the MAS umbrella, corruption scandals, a heavy dependence on extractive industries, and the high levels of violence against women in the country. While in the public eye these movements supported the MAS, their support was also based on a less visible process of debate, power-struggles and critique within the movements themselves. Still, this close alliance with the government recently contributed to a corruption scandal which has allegedly implicated various indigenous and campesino movement leaders who have been accused of pocketing government funds destined for community projects. While the investigation into this corruption case is far from complete, the allegations stuck well enough on many leaders that it significantly lowered popularity for key MAS candidates in regional elections. Another reason for the MAS’s loss in La Paz and El Alto, however, was Morales’ own stance against MAS opponents in the election. Facing potential defeats, the president threatened that he would not work with opposition politicians in El Alto or in the department of La Paz if voters elected them. “If you want more [government-funded] projects, there is Édgar Patana; if you want more projects, there is Felipa Huanca. Think about this, it depends on you,” Morales told voters. The threat had the reverse effect; many voters responded by shifting their support to MAS opponents. Outside of MAS losses in La Paz and El Alto, at the time of this writing, opposition parties are reported to have won regional elections in most mayoral races in key cities, with the MAS winning only four of the nine governorships. On a national level, these results are a far cry from the 60% support Morales received in last year’s general election, which also granted the MAS 2/3 of the seats in congress. In terms of the regional election, the MAS may have misread the political situation, and chose candidates poorly. Morales admitted this much during the actual campaigns. This demonstrates a certain miscommunication between MAS leadership and its base in various parts of the country. However, the opposition victories on Sunday don’t indicate a renewed, united offensive against the MAS. 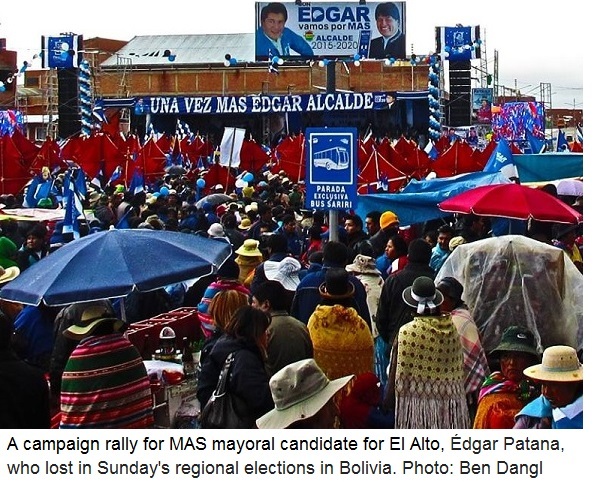 Major individual challengers to the MAS may rise out of this election (such as the Sol.bo party’s Felix Patzi, who won the La Paz governor race), but nationally, opposition from the right and left is still fragmented. Local political dynamics are quite distinct from the national scene; opposition to the MAS locally doesn’t necessarily translate into opposition to the MAS nationally, as an Andean Information Network report on Bolivia’s 2010 regional elections pointed out. In the end, the regional election results speak of the complex political terrain in a country where, in key cities and departments, MAS hegemony is challenged from a variety of political positions. Following the election, new checks and balances to MAS party power may continue to open up spaces of dissent, debate and contestation that will deepen Bolivia’s wider process of change, a process that the MAS doesn’t, nor did it ever, completely control.